Low Pay-One-Price Admission includes ALL Rides, Shows, Attractions, Family Picnic Grove, and WaterPark! FREE Parking! Cash or Discover only. We do NOT accept Visa, Mastercard or American Express, due to their policy on consumer fraud. No Refunds! No Rain Checks! Open for the public WEEKENDS ONLY starting Memorial Day weekend (including Memorial Day Monday) thru 3rd weekend in June. Open for the public EVERY DAY from June 15 thru Labor Day. The Park will also be open on the weekend after Labor Day. Shoes, Shirts, and Shorts must be worn in the Amusement Park, on all Dry Rides and when Ordering food. 52" minimum height requirement to ride alone. Riders 48"- 52" must be accompanied by adult. 38" minimum height requirement to ride. 48" minimum height requirement to ride alone. Riders 38"- 48" must be accompanied by adult. Children between 42 and 48" must ride with adult. 46" minimum height requirement to ride alone. Riders under 46" must be accompanied by an adult. This ride is reserved for parents & children 8 years and older. 36" minimum height requirement to ride alone. Riders 33" - 36" must be accompanied by adult. 42" minimum height requirement to ride alone. Children under 42" must be accompanied by adult. Riders under 36" must be accompanied by adult. "Take A Ride on the Wild Slide", and feel the sensation of accelerating at top speeds down our 40 ft. high and over 400 ft.
Children under 36" must ride w/adult in accordance with rules. Children under 36" must ride with adult. 44" minimum height requirement to ride alone. Children under 44" must ride with adult. Red Baron - This ride is for children only. Dixie Car - This ride is for children only. Children under 36" must be accompanied by adult. 38" minimum height requirement to ride alone. 32 - 36" must be accompanied by an adult. Riders below 36" must be accompanied by an adult. Riders under 42" must be accompanied by adult. 41" minimum height requirement to ride alone. Riders 36" - 41" must be accompanied by an adult. ENCHANTED CHRISTMAS VILLAGE - Visit Santa Claus in his summer home! OLD FASHIONED HAYRIDE - drawn by a farm tractor! OLD McDONALD's FARM - visit live farm animals! 9 Food areas. Proudly serving sumptuous Burgers, mouth-watering 100% Sirloin Hot Dogs, and tasty Chicken Sandwiches or Nuggets. Try our WORLD CLASS, fresh cut Cheese Fries, Mama Santa's Pizza, or tickle your taste buds with our Homemade rich and creamy Fudge! One and all will delight in our fresh spun Cotton Candy and melt-in-your-mouth Caramel Corn or Kettle Corn. From luscious Milkshakes and frosty Sno-Cones to our old-fashioned Waffle and Ice Cream Sandwiches -- there's an entire array of flavors and treats to satisfy everyone in the family! 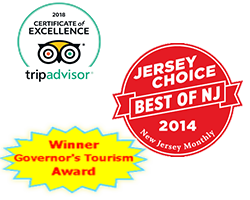 Please call reservations at (908)459-5100. Week Days in May & June by reservation only. No Group Trips permitted after June 28th. 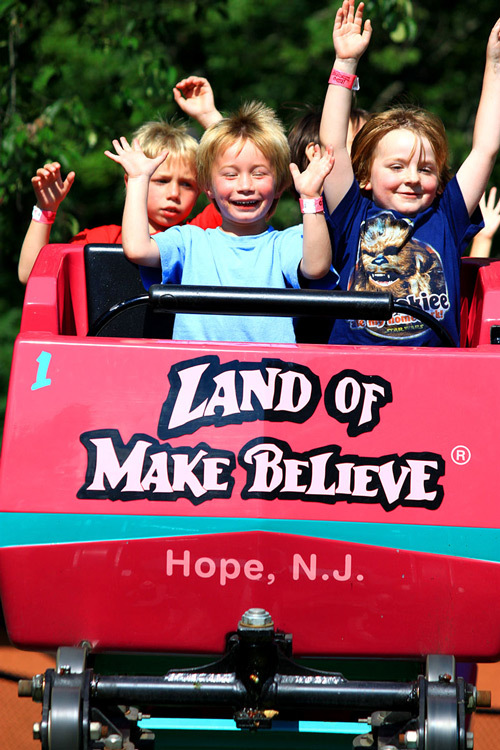 Land of Make Believe is Hiring! Have your Best summer making new friends, learning new skills and having Fun! Join our Team at the Land of Make Believe. It is a unique experience you’ll always remember. Land of Make Believe Office located at 352 Great Meadows Rd. in Hope, NJ. Are you a J1 Work & Travel participant looking for a job? You came to the right place! We have been hiring J1 students since 2000. All of our employees are crossed trained in different positions within our park which allows them to gain more experience and earn more money. We provide our international students with free housing located within walking distance from work, work opportunities exceeding 40 hours per week and End of Season Bonus.